An indie feature film about a man in Spain and his daughter. Plus wine, lamb, some ants and a cat. How many creative expats does it take to make a film in Barcelona? Answer, not that many. At least not as many as you might think. I caught up with the screenwriter Georgina Tremayne, director Carlos Domeque and lead actor Hunter Tremayne from the soon to be filmed Trevor, a low-budget, and hopefully successfully crowdfunded feature about expats, and one in particular called Trevor (as you may have guessed). Tell me about Trevor. It’s a very British and dare I say it, out-of-favour name to put it kindly. Are expats going to be put through the wringer in this film? Georgina: The name Trevor came from when Le Wilhelm, a fantastically flamboyant American who we met through the Sam French festival in New York, kept calling Hunter (who plays Trevor in the film), Trevor. We have no idea why he did that – but couldn’t see the point in telling him he’d got the name wrong. When we were thinking of characters names for the film, we thought: “Trevor”? Ha! There’s no expat wringer, because Trevor’s focus is not about being an expat. Sure, it’s about people who happen to live in a country that’s different from where they were born, but it’s about the dynamic between those people (and one local person) – although it does go into how useless they all are at integrating with the locals and learning the language, although for good reasons that are uncovered through the course of the film. Carlos (the director) will no doubt go on about pathetic attempts at language integration but he should probably tell you that he grew up in London in a Spanish-speaking household, so how the hell does he know how difficult it is to learn a language when you can order off the internet? If anyone’s put through the wringer it’s the character “Dave”, because he has to deal with Trevor for the first time – and Trevor’s useless at communication and a bit of a fruit-loop at the best of times. The actors that play Wendy and Finchy are from Canada; Dave is from Ireland; Trevor and Jen are from England. We’ve all lived in several countries (I’ve lived in Scotland, England, the US and Spain). If anything, at this point, I understand the US more than I do the UK because I’ve been away from the UK so long that I can’t even vote on Brexit. The film’s multi-cultural. It’s not James Bond, Downton Abbey, Sherlock Holmes, This is England, The Full Monty or Trainspotting. It’s Trevor. If someone wants to chuck it in a box, then how about (big stretch here because why not? ): it’s a gentile Woody Allen without the angst, the budget, the therapy, the doctor, more therapy – and with more alcohol; mostly Spanish wine. It’s a comedy but not the sort that needs a truckload of banana skins. It’s not Bananas. P.S. Eddie Izzard was born south of Yemen. Does that make him an expat? Carlos: The name is from the leading character, like his name he is of a certain generation, certain mentality and prejudices. This is however a film where we are at pains not to caricature, so even though the plot does put all the characters through the wringer we don’t set out to put expats in a bad light. But obviously we do have a good laugh at their expense, churlish not to really. Actually we laugh at everyone in this film. Hunter: Only insofar that Trevor himself, despite having lived in Spain for many years, only knows the Spanish for “a glass of wine, please,” “a bottle of wine please,” “the check please” and that universal word, “taxi!” Trevor himself appears to be foolish, but as the film movies along we find that he is very far from foolish: he is ultimately brave, even heroic. Do you have filmmaking backgrounds? Is this the first film you’ve written/directed/acted in? G: It’s my first screenplay. I’ve written several full-length plays. This is a relief to go outside. C: I have been meddling in films since an early age. At university in UCL I managed to use the equipment there to make my first shorts, same time as this guy called Christopher Nolan was there, we used the same ancient 16mm camera and Steenbeck edit machine. Not sure what happened to him since. Anyway eventually someone took pity on me and I got to make coffee in film edit suites or cutting rooms, as the old timers call them, and I ended up making a living as an assistant and then an editor on feature films. Like a true film junkie I direct short films in my spare time. Trevor will be my first feature film as director. H: Not at all. My film Lapin is currently playing at film festivals and I am shooting an Italian English-language film in Italy and Spain in April. I am a professional actor and make my living from my earnings in TV and films. I do theatre, too, but that’s just for fun and to raise money for worthwhile local causes. Our theatrical company has won awards internationally, but every production we put on helps people who need help. We do what we can. You’re all based in Barcelona, and this blog is about Barcelona. Please tell me the film is to be entirely shot in the city, or at least in Catalonia? G: I spend time in London and more in Barcelona. Yes – Trevor is shot in Catalonia! We’ve found a rural casa that could work beautifully for its backdrop scenery and interiors for the whole film – or we’ll find something similar where the owner’s away if we don’t raise enough to rent the place. C: Yes it will be shot in the immediate outskirts of Barcelona. The great thing about this place is that in 30 minutes you find yourself in the countryside. 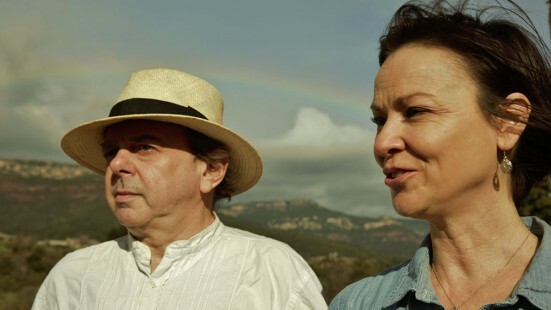 Is Barcelona, or to a larger extent Catalonia a receptive place to make a film? What might filmmakers have to consider when using this location? C: Catalonia obviously has the advantage of great weather, something like 200 days of sun a year on average. But also a variety of many views, landscapes within easy reach. Barcelona has the advantages and variety of a European capital but is still a moderately sized city where you can move around easily. H: The most important things they would need are a terrific screenplay and a director and actors of extremely high quality. Fortunately, we have all of those things! For some reason (probably the name) I’m assuming this is a comedy. Am I doing the name an injustice? G: It’s a subtle (and sometimes not-so-subtle) comedy with some situations that will make you laugh out loud, maybe cheer, get engrossed. There are some choke-up moments too. Want to read the screenplay? C: A bit like life, it’s full of comedy for the viewer, but the protagonists do have to go through moments of high drama before they get to crack a smile. It is after all about a tense family weekend. H: Not at all. Comedy with some drama and perhaps a tear or two at the end. Crowdfunding is an increasingly popular way to get anything made. Was it the only option available to you? G: Crowdfunding is our Plan A because investors will see this film as high-risk as the actors aren’t that famous (yet). They can act though and they look fantastic on camera. C: The project grew from a collaboration between people of varied backgrounds and yet like-minded, crowd funding seems like a natural extension of that. H: No: we will make it anyway. Crowdfunding means we can make the film much faster. You’re asking for £30k. Bugger all for any type of film but still not a small amount. What will the money be spent on? Plan D – Jeff Faustman, the composer in LA, can also do post-production sound mix etc (he’ll just take longer and we want to hit Rotterdam [festival]). C: We are very lucky that the actors and the principal crew are giving their time and their talent for a deferred fee. We have negotiated some great deals with local service providers but we still need to cover equipment hire, transport, insurances, catering. The amount we are raising will not just also pay for the shoot but also for unavoidable costs we have budgeted for post production and deliverables for distribution. What that means is that with our funding goal, this film will be ready to show in a cinema near you. H: There is a breakdown of costs on the Indiegogo page. But basically, the money we raise dictates the quality of the equipment we can hire. Right now, we can shoot the movie on smartphones, and we will if we have to! Whatever happens, Trevor will be made. As this blog is so intelligently topical on occasion, would you say this project is an example of how a Europe without borders can help the arts? G: Forget LA and London (okay, don’t). But know this, if you don’t already: Barcelona is a film hub in growth mode. There is tremendous talent here who speak a range of languages and can act like the best. It’s cheaper too. No surprise. It’s usually sunny so the budget’s not killed by rain days. As a city, Barcelona lets you breathe and meet and explore creative projects with people from many cultures. Culture and imagination can mesh – and the projects that are born from that “culture-clash in the greatest way” are unmatched anywhere else in the world. There ain’t no ghetto here, hombre (apart from c/Robadors in the Raval. Lovely place). C: Absolutely! It’s about people who can move across European borders because they want and they can, and it’s made by people who are just like that. Our producer is based in London, I live and work here and in UK, as does Georgina the script writer. The cast work across Europe. Many of the crew live in Barcelona and work in UK. None of us are jetsetters, just normal people. Moving beyond Europe, we also have a composer who lives in LA. Two of the cast are from Canada, I was born in Venezuela and grew up in London, Georgina and Hunter spent a lifetime in New York, till they got deported. This film is an example how the arts go beyond borders. H: Yes. Without the ability to live and work in Spain this film would be impossible, or at least extremely difficult, to make. What can people do if they want to help Trevor happen? What are some of the crowdfunding rewards that are still available? G: People can truly help us by getting on board by writing about Trevor, donating, talking to other people who support indie projects, tweeting. We really can do this film for GBP30k with a fantastic camera. Plan B – we’ll use a cheaper camera and do it for less. Plan C et al we’ll go cheaper and not eat. It’s okay. We can all stand to lose a bit of weight. We are going to get this film made, and edited and scored and finished. It’s just going to be easier if people are willing to help us in whatever way they can. We are aiming to enter it into the Rotterdam Film Festival – the perfect international stage for an indie film. Entry date: October 2016. People can donate via the Indiegogo link at the bottom of the page. Perks like: a WINE LABEL that will be customised with your name or photo on it and featured in the film, your FAMILY PHOTO shown in the film, Associate or Executive PRODUCER. Or a DIGITAL DOWNLOAD or a fiver is great too. It all helps. AND we want to know exactly who helps us so that when your project needs support, we can all be there for you. H: Please see our Indiegogo page! Lots of fun rewards there! If I support the project and the film is made will I be able to see it or will it require distribution? Will there be a special Barcelona screening for backers? G: Perks DIGITAL DOWNLOAD for 15GBP or SUPER SUPPORTER for 25GBP – both for your Private Viewing (not public) so you can see Trevor while we take it to film festivals and canvas for distribution. A special Barcelona screening and the biggest party in town. Why on earth wouldn’t we? We want to add an NHS NURSE PERK to get Roxie who works in the A&E in Lancashire Hospital to fly here and be on set for health and safety during filming – so we really want to know if people think that’s a good idea and if anyone will sponsor her flight? But we can only do this if we hit target or get close to our target and we can secure the shooting dates to happen in one go – otherwise we’ll have to film over a longer time-span and that won’t work for Roxie. C: Backers can opt to have a digital download of the film as soon as it is finished. Once it is finished we will be doorstepping many distributors who will distribute the film because we know where you live and also where your children go to school. H: Every feature film requires distribution. There will certainly, however, be special Barcelona screenings for backers as soon as the film is complete. So, there you have it. Check out the Indiegogo crowdfunding project for more information. In fact, if I’d have read it first I probably wouldn’t have asked such dumb questions. This is the kind of project I love to support in Barcelona. I encourage you to do the same. Every little will help! And Trevor will be eternally grateful. Did you find this post interesting? Let us know what you think by leaving a comment. The Catalan Language: Do You Really Need It? Natura Barcelona – Pau’s done it again!